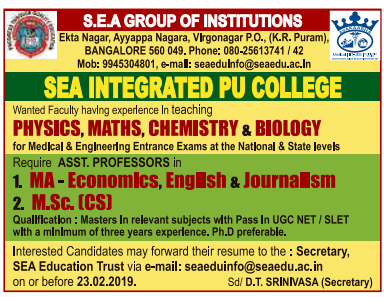 SEA Integrated PU College, Bangalore has advertised in the DECCAN HERALD newspaper for recruitment of Assistant Professor jobs vacancies. Interested and eligible job aspirants are requested to apply on or before 23rd February 2019. Check out further more details below. About College : Education at the Pre University Levels in SEA group of Institutions is a unique experience. Young and aspiring members of the Learners Community come across a unique ambience where in highly dedicated and particular teachers always focuses on training them in their preparations to obtain a professional life in the most ethical and transparent manner by seamless integrating the circular and co-curricular activities in the most competitive member. Regular and routine interactions with leaving luminaries with proven accomplishments a right mix of establishment through games, educational tours, varieties of extra curricular activities integrated into the regular course schedules makes it a unique educational experience, here in the campus.All these make education at S.E.A. an enriching, rewarding experience. Adequate facilities has been established in the PU college to expose the students into use of computers as a method of teaching and curriculum planning. This state of art facilities with experienced tutors enable the students to take the leap forward in tune with the emerging technologies. PG with pass in UGC NET / SLET with a minimum of 3 years experience. Ph.D is preferred. How to Apply: Interested and eligible candidates are requested to send applications along with CV and copies of supporting documents of certificates and experience & PP size photos to the following email address.